Happy Birthday to Roy Gault born on May 28, in Vernon, Waukesha, Wisconsin. The Gault family moved to Skagway in the early 1900’s. The father of the clan, William worked for the railroad and died in 1905 of heart failure at 58 years old. 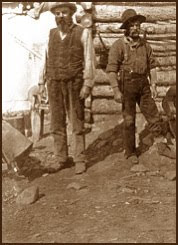 His sons, Leland and Roy also worked for the railroad. 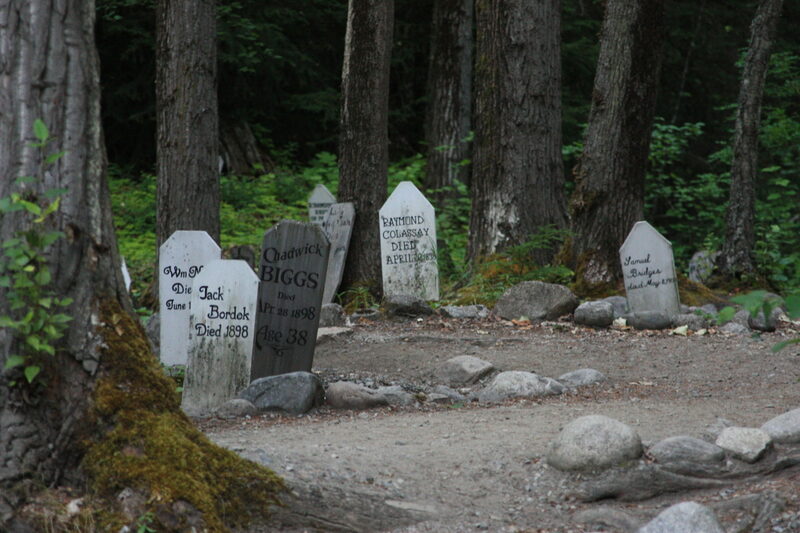 Their sons and daughters also stayed on until their deaths here in Skagway some until the 1960’s. 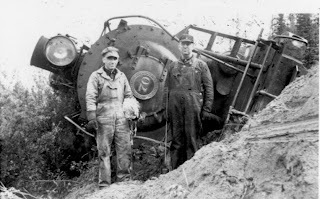 Roy was the engineer on the White Pass accident in 1940 of Engine 70. Above is J.D. True’s picture of Roy and Jess Wallace by Engine 70 on her side near Mile 82. The accident was caused by an open stub switch. The engineer was Ray Gault, Conductor was Chris Larson, Fireman was Jess Wallace, and Brakeman was Mickey Mulvihill. Censuses; World War 1 registration; J.D. True. Steve Sheldon was the U.S. Marshal for Haines and Skagway between 1925 and 1930. The museum in Haines is named for him. Steve and his wife Elisabeth were lifelong collectors and his extensive collection was donated to the city of Haines. Steve was born on this day, May 27, 1885 in Columbus Ohio and moved to Alaska in 1911 to work with Michael Heney on the Copper River Railroad. He met Elisabeth, married and stayed in the Haines and Skagway area. He died in August 1960 in Seattle. 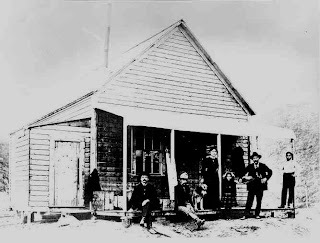 John Smart was born about 1885 in the Carcross area. He was the son of Dawson Charlie, also known as Tagish Charlie or Káa goox. On this day, May 26, 1903 John was run over by the train at Carcross. He is probably buried in the Carcross cemetery with his father who fell off of the Carcross bridge in 1908. Pictured above is Charlie at the far right with family. Mr. Whitcomb was born in Keene New Hampshire in 1873 and came to the Klondike in search of gold. He died on this day, May 25, 1898 at the south end of Lake Tutshi, accidently by gunshot. 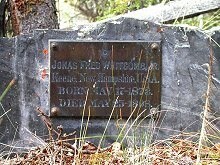 He was buried at the south end of Windy Arm. “In May 1898, Whitcomb and A. P. White, of Houghton, Massachsetts, went ahead to clear a trail from Tutshi Lake to Windy Arm. On the 25th, while leaning over to start a rock rolling down the hill (possibly during a hunting excursion), Whitcomb’s revolver slipped out of its holster and fell to the ground, discharging it. The bullet hit Whitcomb in the chest, killing him immediately. 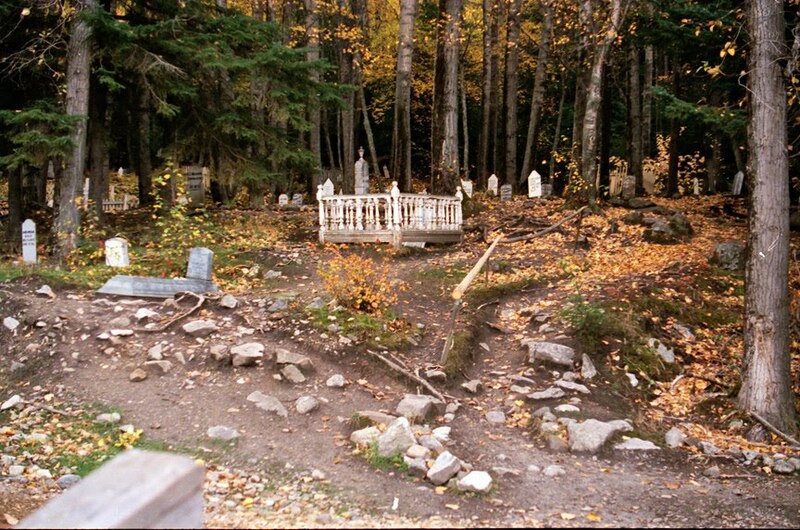 On May 27th, he was buried in a Masonic ceremony at the south end of Windy Arm. His father sent a brass plaque for the grave, and it was mounted on a piece of slate. His death was briefly reported in the July 2, 1898, edition of The Klondike Nugget. There appears to have been two other burials beside Whitcomb – right beside on the left is a slate marker with “H. M. H.” chiselled into a piece of slate by the same hand as the initials “J. F. W. Jr.” on the back of Whitcomb’s slate marker, while several feet to the right is an apparent exhumation. The 1898 diary of Stewart L. Campbell reports that on Monday, May 9th, 1898, “a Mrs. Howe [was] buried at end of lake. 72 years old”, and on May 15, “3 men drowned around the point.” He also reports that he took a photos of the graves at the south end of the lake, so the deaths he reports are possibly related to this site. Mr. Nakano is one of the few Asian people buried with markers in the Skagway cemeteries. He died on this day, May 21, 1900 of typhoid. His marker is in Japanese and can be found up the hill behind Soapy’s marker. Captain Richardson got around! He arrived in Skagway in 1902 with the 9th Infantry. He was originally sent to build Ft. Seward in Haines as an army engineer. He was also a Captain on the Yukon river and a Major for the Alaska Board of Road commissioners. He was a General in the Infantry Brigade in World War I in France and Russia. The “Richardson Highway” is named for him. In 1900 he wrote “Relief of the Destitute in the Gold Fields, a compilation of Narratives of Explorations in Alaska, (Senate report 1023, GPO). Richardson was born in 1861 in Texas and died on this day, May 20, 1929 in Washington D.C.
George Brackett was the Mayor of Minneapolis and was a Civil War vet. In the Civil War he provided the army of the Potomac w/beef, and later fought with General Sibley on the plains in 1863. He was involved in the building of the Northern Pacific Railway. He looked like Lincoln and was described by Minter in his book, The White Pass. He is perhaps the person described by the saying, “let George do it”. He came to Skagway in September of 1897 and started to build a road up the White Pass or Trail of ’98. He charged people to use his road, but after the railroad started to be built he lost control of the road. The White Pass & Yukon Route eventually paid him for the use of the road but not after many confrontations and frustrations. 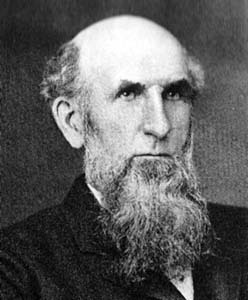 Brackett was born in 1836 in Calais, Maine and died on this day, May 17, 1921 in Minneapolis. Alexander Irving from Scotland who worked in the White Pass Commissary in 1898-1900. Mortimer Irving Stevens born in Illinois and worked as both an engineer and a reporter and publisher for the Skagway Searchlight in 1898. Evelyn Frolander who was born in Indiana and lived and worked in Skagway from 1929 to 1974 as a nurse in the hospital. Robert L. Rapuzzi born in Alaska, probably Skagway, in 1920.
and most important of all – me, seen above biking in Dyea! Pat Flynn was born in 1861 in County Tipperarry Ireland and immigrated to the United States in 1876. He married Ellen Flaherty, an Irish immigrant from Galway, in Tacoma, Washington, where their daughter, Helen Grace (“Nellie”) was born in 1893. 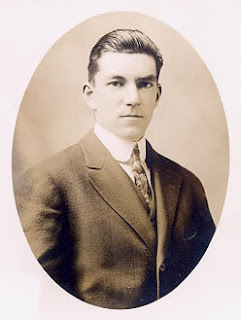 Their son John William (“Willie”) was born in Ellensburg in 1896. Another son, Owen Patrick, was born in Skagway in 1904. Patrick worked for the White Pass and Yukon Railroad and his sons followed him into the profession. 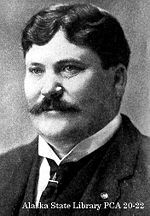 Owen later became an accountant and served as city clerk for the City of Skagway. Willie spent his entire career with the railroad. Patrick worked for White Pass as a car inspector and carpenter until his death on this day, May 13, 1935 in Skagway. Ellen his wife had died 9 days earlier also here in Skagway. They are buried in the Pioneer Cemetery. Mr. Glave was a reporter for Frank Leslie’s Illustrated Magazine in the 1880’s and 1890’s. He is famous for having crossed the Chilkoot Pass out of Dyea without Native guides in 1890. Edward Glave was born in 1863 in England and died on this day, May 12, 1895 in the Congo, suddenly. He was only 32. The picture above is of Dalton and someone else who may be Glave.